Red Comet, an accredited, self-paced, online high school launches a credit course on world religions. 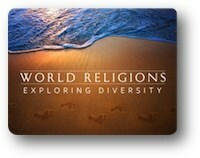 Red Comet is introducing the elective course “World Religions: Exploring Diversity” this summer. Throughout the ages, religions from around the world have shaped the political, social, and cultural aspects of societies. This course focuses on the major religions that have played a role in human history including Buddhism, Christianity, Confucianism, Hinduism, Islam, Judaism, Shintoism, and Taosim. Students trace the major developments in these religions and explore their relationships with social institutions and culture. The course discusses some of the similarities and differences amongst the major religions and examines the connections and influences they have on our modern world. Red Comet is approved by the Office of the Superintendent of Public Instruction (OSPI) in Washington State as both a “Multi-District Online School Program Provider” and a “Multi-District Online Course Provider”. Red Comet offers online programs that are complete, demanding and engrossing. The online program from Red Comet earned top ratings in Washington State in terms of student satisfaction. Red Comet’s online learning offers challenging topics that are presented in a way that students can easily understand and comprehend. The online high school uses a variety of different learning techniques and tools in its program in order to ensure a high rate of course completion.